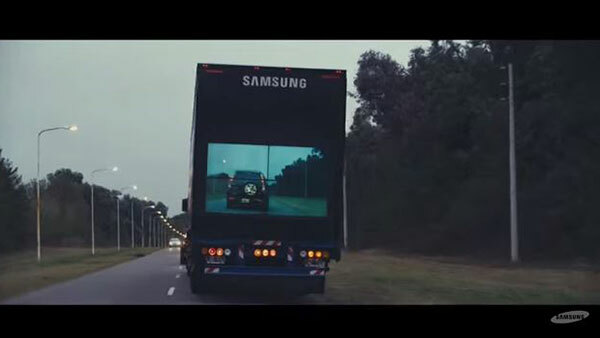 Samsung is developing a "clear" truck, using cameras and video screens, so drivers know what's in front of the truck and if it's safe to pass. A front-facing camera with night vision capability will be projected on a four-screen video walls mounted on the back of the tractor trailers. Drivers stuck behind the truck will know what is up ahead, and if it is safe to pass. Samsung says the technology will help reduce the number of crashes from cars passing trucks on two-lane roads without knowing if they have adequate space or time. However, there is some question as to whether the system is economically practical. In a post on their Samsung Tomorrow blog, the company said they tested a prototype truck in Argentina, where traffic accidents are high. The company said the next step is to work with local non-profits and government regulators to ready these "clear" trucks for the road.